It has been important to have a mantra on this trip- a reminder of why we’re here riding all these miles, climbing up mountains, seeing new sights every day and feeling the social exertion of meeting new people at every turn. Climbing up Rainy and Washington Passes was the first big challenge we’d faced on this trip so far- about 6,000 feet of climbing over almost 70 miles. 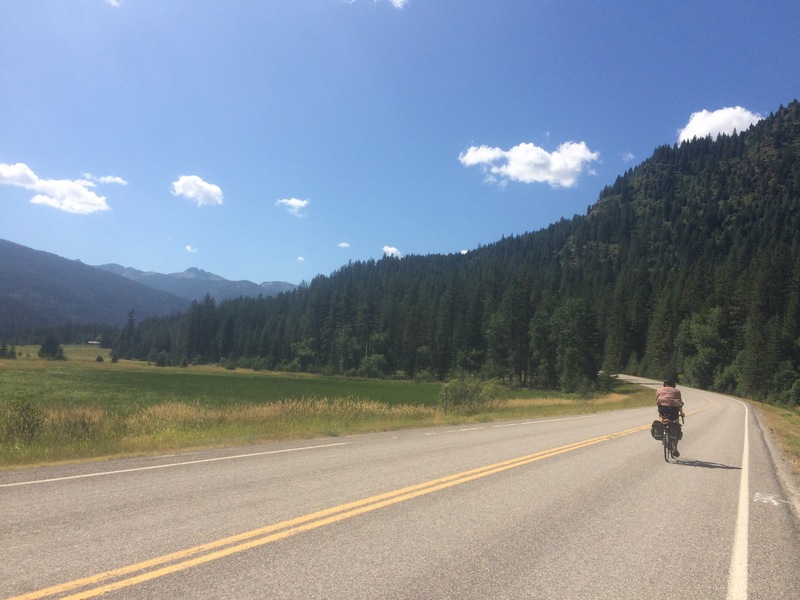 Granted, we broke the journey of the Skagit River Valley to the Methow River Valley over two days, but arriving at Washington Pass (elevation 5,477) after climbing all day felt like standing on the top of the world. Such an accomplishment. 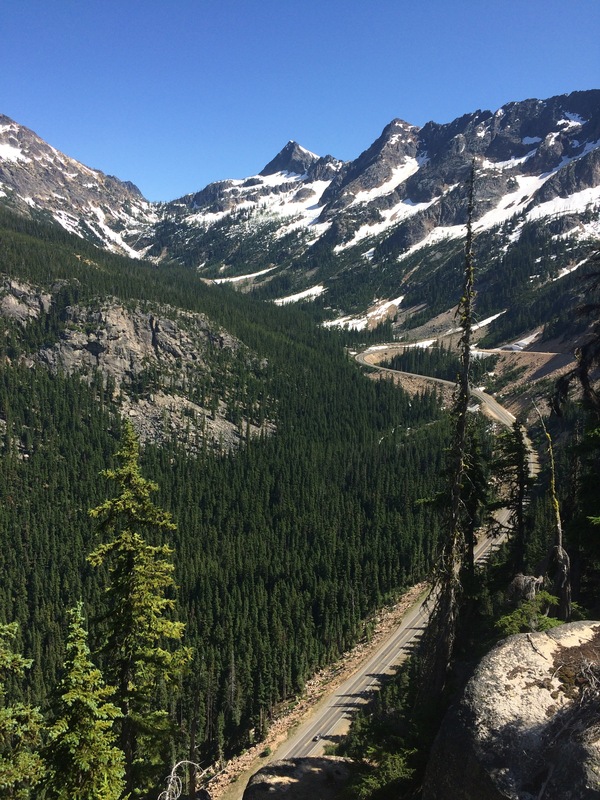 Looking out over the North Cascades Highway 20, which cut a stark line between craggy, snow-dotted mountain peaks, my chest felt filled to bursting. 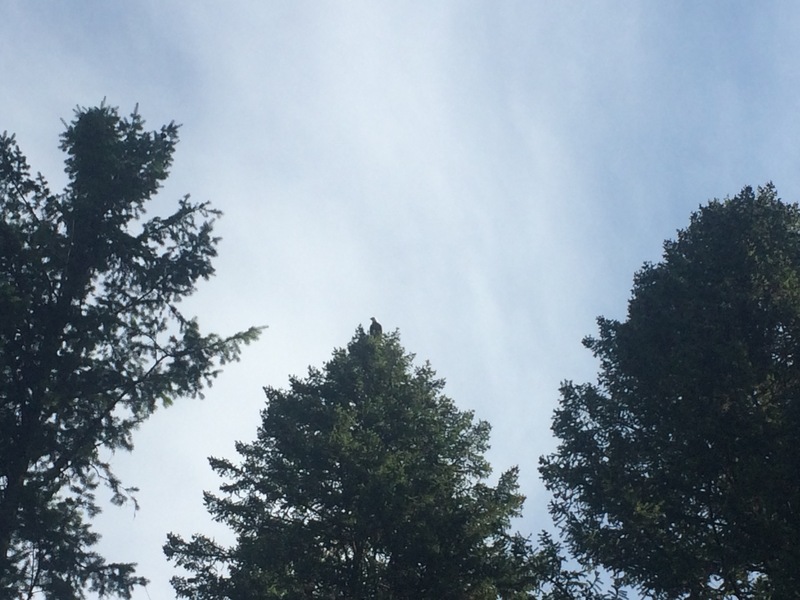 The emotions of what we had just done flooded through my body like electricity: pride, fear, relief, wonder, gratitude, awe, disbelief, I seemed to feel it all. Luckily, someone else had felt the same way: William Stafford, the former poet laureate of Oregon. 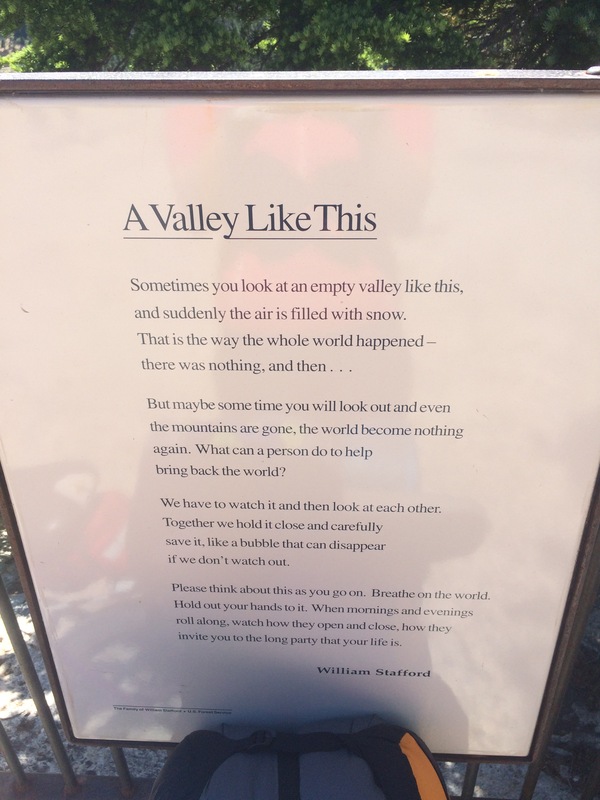 His poem, “A Valley Like This,” was framed and displayed at the Washington Pass Overlook for all to see and absorb. This poem has stuck with me throughout this trip, and pops up in both awe-inspiring and painful moments. 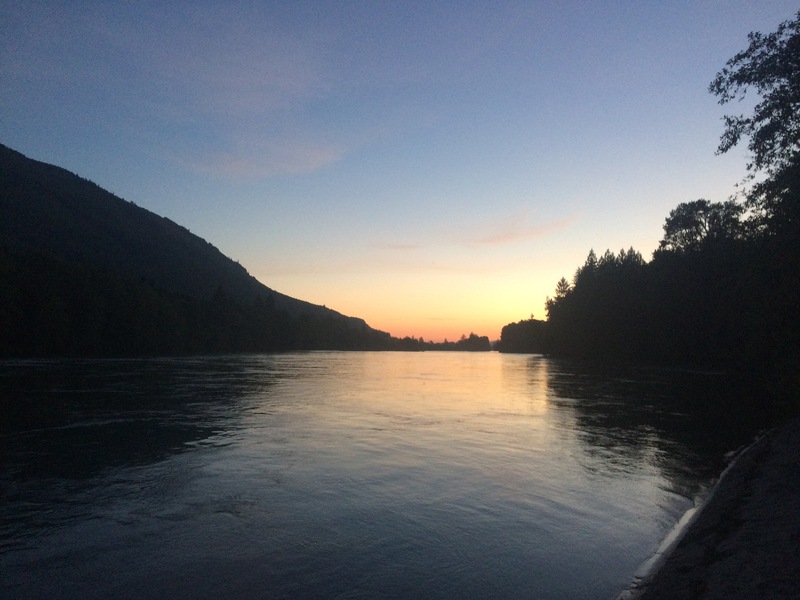 The feeling of gratitude and wonder that Stafford gives his readers in the poem struck a chord with my reasons for this cross country journey: enjoy every moment, remember that every day is a gift and every view is a gem, and that exploring something new every day should not be taken for granted. So as I’ve climbed hills long and steep, felt the strain of my muscles, run out of water in 105 degree heat, and fallen into my sleeping bag exhausted many days, I’ve had to remind myself of Stafford’s intention: “every day is an invitation,” a invitation to experience the world, see vistas from roads I’ve climbed myself, experience the full extent of my body even if it’s painful, and meet new people every day. So thank you, William Stafford, for inspiring my riding mantra. In that vein, every day on this trip have been an invitation to new people and places, thus far through Washigton, Idaho, and Montana. 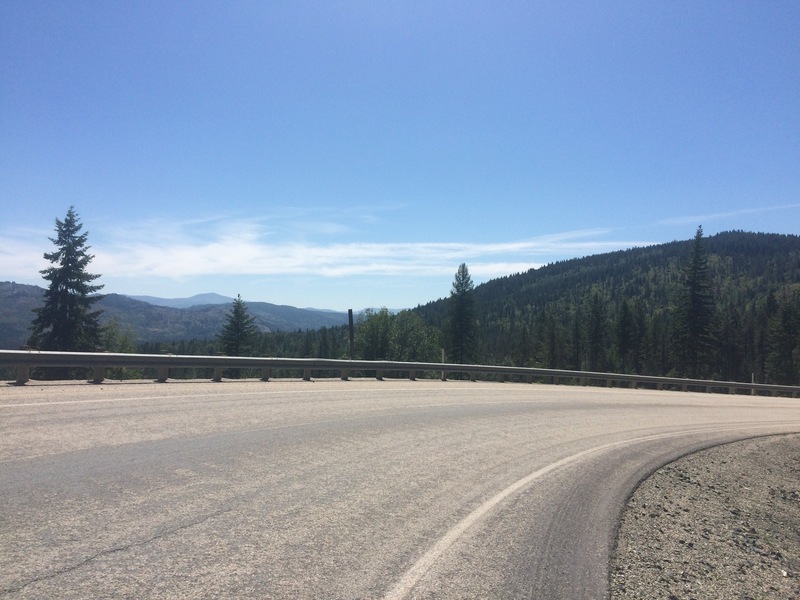 At an average of 50-60 miles per day, we can see the topography change quite dramatically throughout our daily ride. The last couple weeks, we’ve also had the good fortune of camping on public lands- experiencing national and state parks as well as national forest treasures. Evenings are a welcome opportunity to explore a new place, relax, stretch, meet fellow cyclists, swim in remote lakes, and of course enjoy good food after a rewarding day of riding. Rasar State Park was the first place we stayed heading east on the Northern Tier after a week on the San Juan Islands. We felt the gravity of the journey ahead, finally heading east, and arrived after a long day of riding from Anacortes. Luckily we were greeted by our first fellow touring cyclists, Mike and Hans from Maine, who are on a “Shared Vision Quest” along the Northern Tier. Mike experiences blindness, but his friend Hans rides ahead of him, guiding him through precarious road conditions. We were amazed at their story and felt fortunate to stay with them for two nights before they jetted on ahead of us. 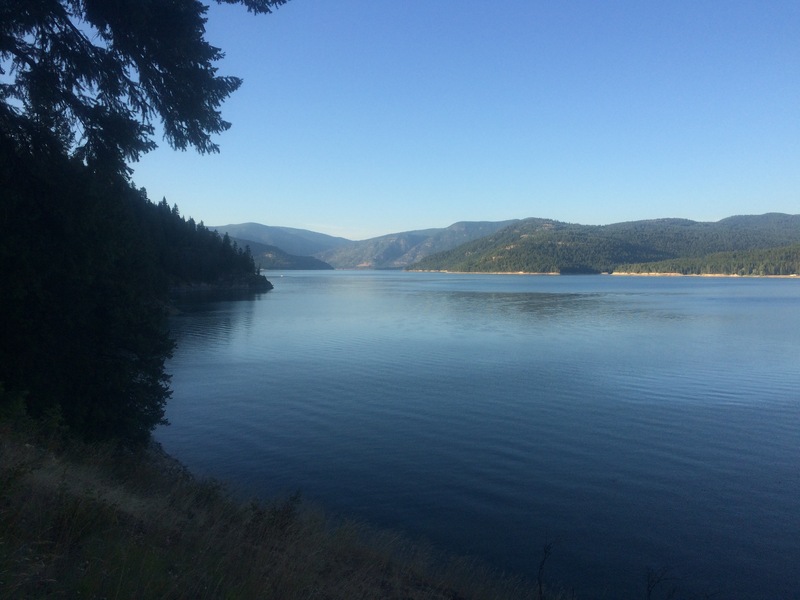 The Panhandle Campground outside of Ione, WA is located on the peaceful shores of the Pend Oreille River that flows into Idaho’s Lake Pend Oreille. We shared this campground with eight other cycle tourists that we had met over the previous couple days, a lovely group that we’ve spent the last week with on our journey. Mike, the Singing Cyclist, has been one of our companions. He on a perimeter tour, which means that he is riding the perimeter of the USA on his recumbent bike Clara T. Strapped to the back of Clara is a Taylor GS Mini guitar and an entire quiver of harmonicas. Mike had regaled us with songs and stories of his adventures for hours, sometimes both at the same time. The next night we all stayed on the shores of Bull Lake at Dorr Skeels Campground. We had just spent the day crossing the Montana border and experiencing the incredible grandiose mountains that Western Montana offers. On our way into the lake on Bull River Road, we rode right into the Cabinet Mountains. With each turn and epic descent, we glimpse views of towering peaks, glowing green and lush valleys, and still mirror-like lakes. Eventually Bull Lake presented itself: blue and sparkling. At camp, we drank beer procured at the local tavern and ate carrot cake from a bakery in Clark Fork, ID. Oh, the life! Just past Libby, MT is the Libby Dam, a tower of concrete dividing the Kootanai River and Lake Koocanusa. 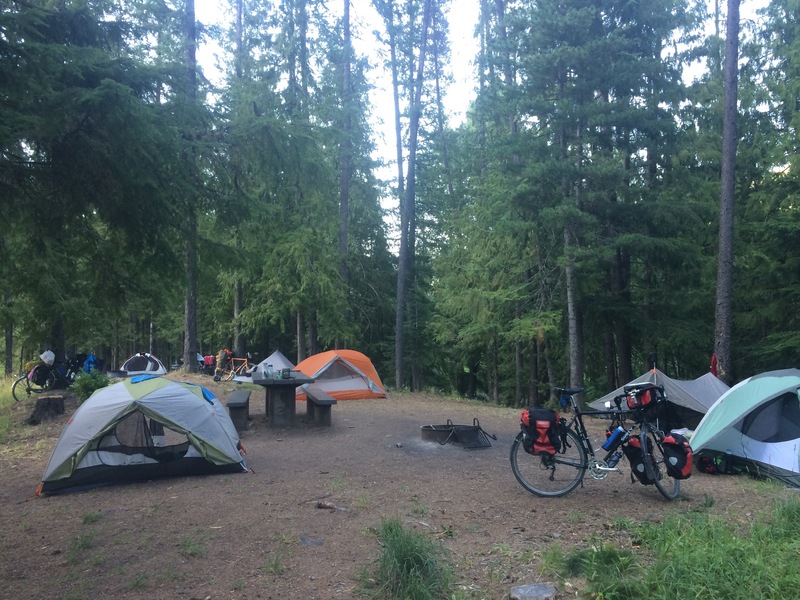 We camped on the West side of the lake at the McGillivray Campground, where the hiker/biker campsites perch on a cliff overlooking the lake through a curtain of trees. We got in late, but not late enough to miss the sun setting golden behind the hills. Tomorrow we ride into Glacier NP…undoubtedly more wonders to behold there! Tags: Adventure Cycling, bicycle touring, bicycles, Make America Bike Again, mountains, Northern Tier, travel, Washington. Bookmark the permalink.